The Seattle mayor signed an executive order saying the city will further help public high-school graduates attend community college. A team is supposed to come up with a long-term plan within 100 days. 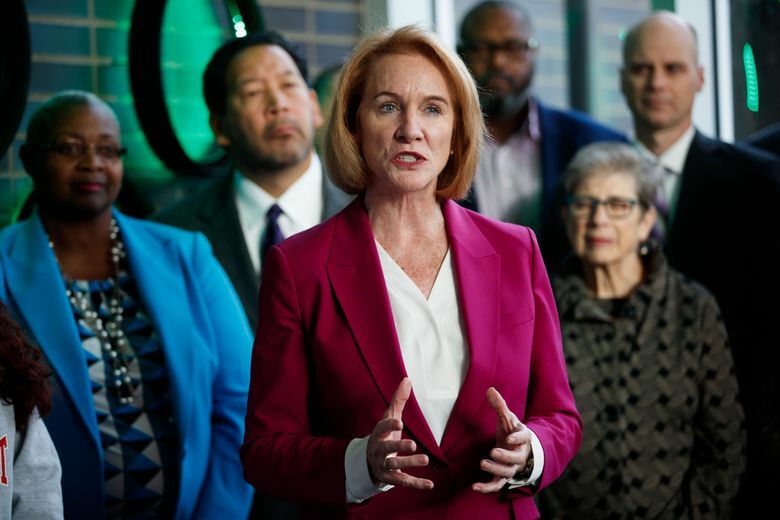 Jenny Durkan cemented a key campaign vow on her first full day as mayor Wednesday, signing an order for Seattle to make community college free for new high-school graduates. She still needs to figure out how to pay for the program in the long-term, however, and voters may get to weigh in on that. Durkan in August pitched a Seattle Promise program she said would offer all of the city’s public high-school grads up to two years of tuition help at community and technical colleges. The new program will be modeled on the existing 13th Year Promise Scholarship, which has been privately funded by Seattle-area businesses and individual donors and which has allowed students graduating from Cleveland, Chief Sealth International and Rainier Beach High schools to attend South Seattle College free for one year. “There is no better investment we can make as a city than in the education of our young people,” said Durkan, who was sworn into office Tuesday. Durkan was introduced by Myron Ramirez, a 25-year-old Cleveland graduate who used the 13th Year Scholarship as a launchpad to a construction-management degree from the University of Washington. Like half of approximately 500 scholarship students surveyed, Ramirez believes he wouldn’t have reached college at all without the help. Now he’s a project engineer working on Google’s massive new office complex along Mercer Street in South Lake Union. In a survey, 60 percent of scholarship students said they were the first in their families to attend college. “That first year gave me a taste for knowledge and opened my eyes about how big the world was and how far education could take me,” he said after the event. Wednesday’s executive order, which the mayor signed at South Seattle College with students and supporters looking on, is only a first step and calls for a phased-in approach. The program will begin next fall with a new group of graduates from Cleveland, Chief Sealth and Rainier Beach and by offering a second year of free college to students now benefiting from the 13th Year Scholarship. Durkan’s order doesn’t say when she expects the program to be available to all students from all public schools. Instead, it calls for a team with representatives from various city departments to develop by March 8 a plan to achieve that long-term goal. The mayor said she wants to make sure the program adds counselors and support systems as it grows. Saying the team will identify funds to pay for the program’s future rollout, the order mentions federal, state and regional resources, as well as money from local property-tax levies and philanthropic organizations. Earlier this year, then-Mayor Ed Murray proposed expanding the scholarship to additional schools with money from the city’s new tax on sweetened beverages. Durkan’s order directs the education and budget departments to immediately consider including the Seattle Promise program in a proposal for a 2018 ballot measure renewing the city’s existing Families and Education Levy and Seattle Preschool Levy. During her campaign, the mayor said she would look at asking voters to not only renew but also to increase the combined size of the levies, which expire next year. The idea of using Families and Education Levy funds for a college program encountered some pushback during the race. When Seattle’s public-school teachers union endorsed Durkan opponent Cary Moon in October, the union praised Moon’s commitment to using the levy exclusively to narrow the opportunity gap between more- and less-advantaged elementary, middle and high-school students. The mayor and others Wednesday spoke more about the importance of college than about funding details, however. Young people from wealthy families are much more likely to earn college degrees, noted Seattle Colleges Chancellor Shouan Pan. “Community colleges are the gateway to the American dream” for lower-income and immigrant students, he said. Tuition at Washington’s 34 community and technical colleges is $3,936 for state residents this year, and the 13th Year Scholarship covers the balance between that and other financial aid. Books and living expenses aren’t included. In August, Durkan estimated her expanded program would cost about $4.5 million in 2018 and $7 million a year after that, based on an estimate that 25 percent of graduates would take part. As with the existing scholarship, Durkan’s program will have no income or GPA restrictions and will be open to undocumented students, a spokeswoman said. In August, Durkan said graduates would be eligible for the program for two years after leaving high school. Durkan acknowledged Wednesday that she didn’t come up with the free-college idea. She said she wants to build on initiatives that are already working. This story has been updated to reflect that the 13th Year Promise Scholarship has been funded by individual donors in addition to businesses. Information on donating to the program can be found here.